" Small enough to not get in the way. Large enough to hold my machine and humidifier. " " I use this for travel. It is easy to break down and reassemble, and holds my CPAP securely. " Wish you had the room on your nightstand back from a CPAP Machine? Going someplace where there may not be a nightstand at all? 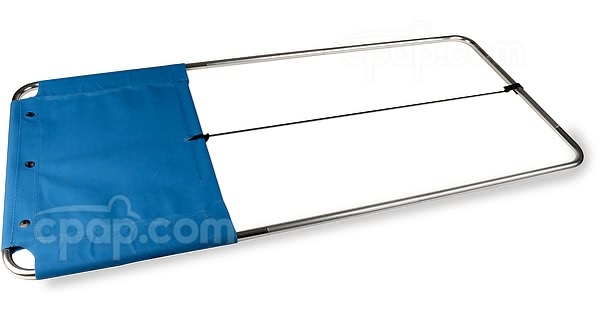 Don't fear, the Bedside CPAP Table has got you covered. Simply slide the table between the mattress and box spring of a bed to secure it in place, then place the CPAP with or without humidifier on the fabric holder. The Bedside CPAP Table by Arden Innovations provides a great option for those who have small nightstands or nightstands that are too full to house a CPAP machine. The table is positioned between a mattress and box spring for a stable configuration. 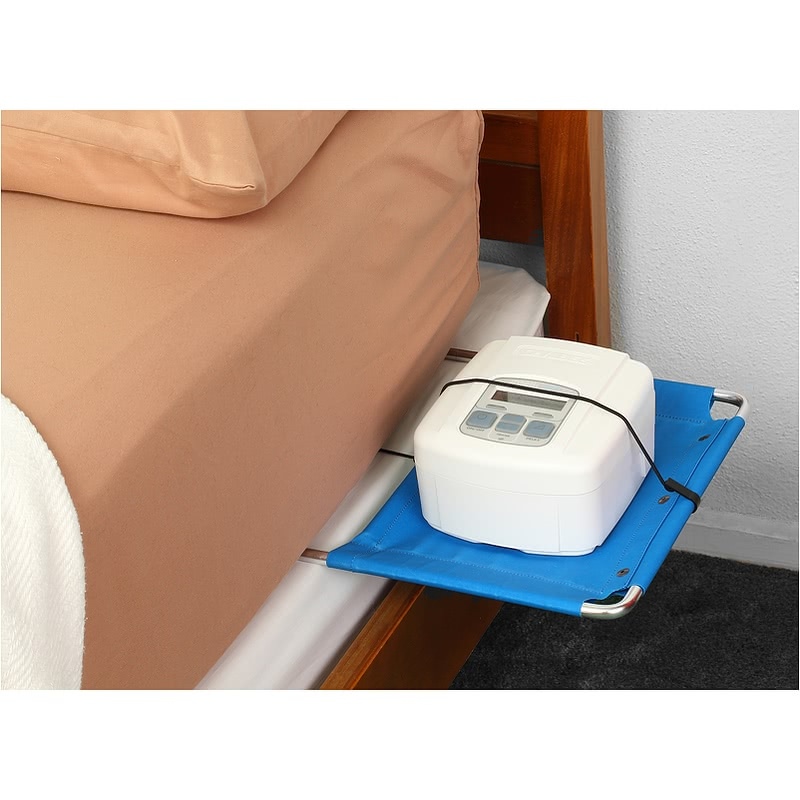 The Bedside CPAP Table features a fabric platform measuring 13.5 in W x 10 in L, which can accommodate any CPAP machine alone, and many with their respective humidifier. 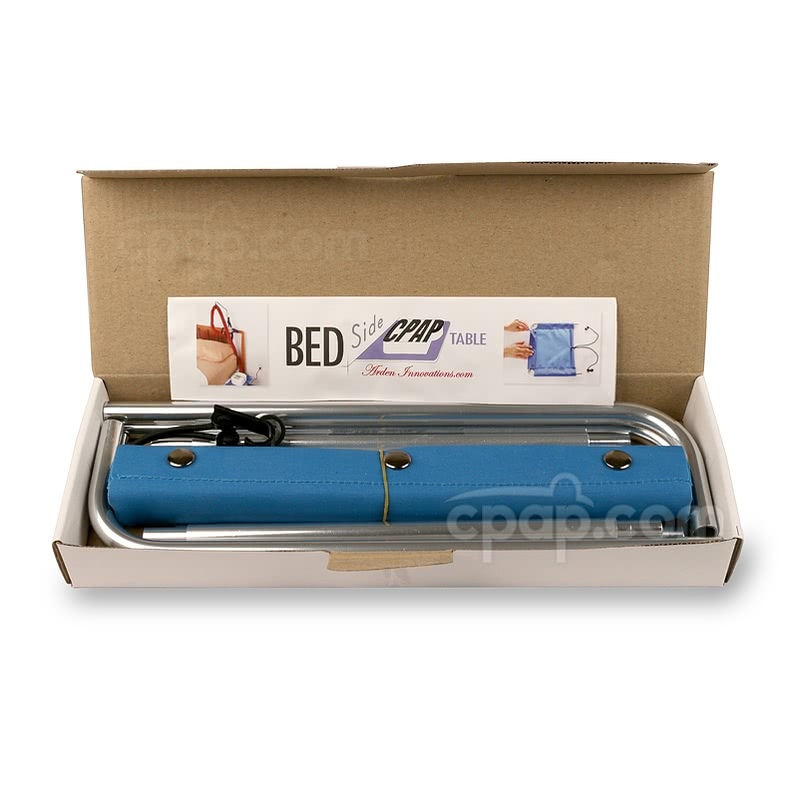 With the CPAP placed on the Bedside CPAP Table, the machine may be closer than if placed on a nightstand. This will allow for quick access to change settings or turn the machine on or off when necessary. 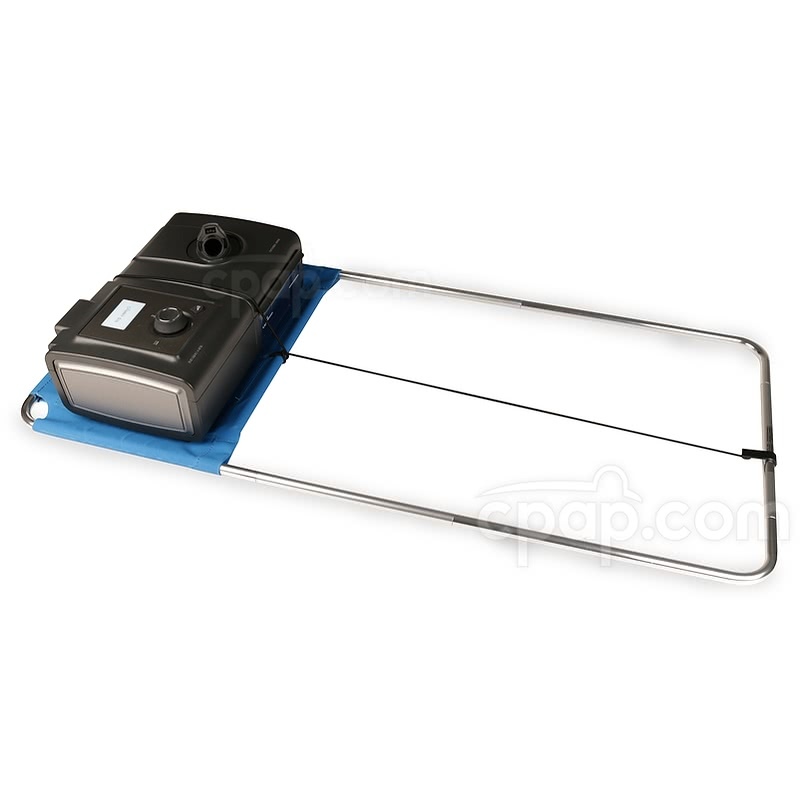 Having the machine below the mattress slightly can also keep the lights of the CPAP out of the eyes, and can help make machine noise seem less distinct. 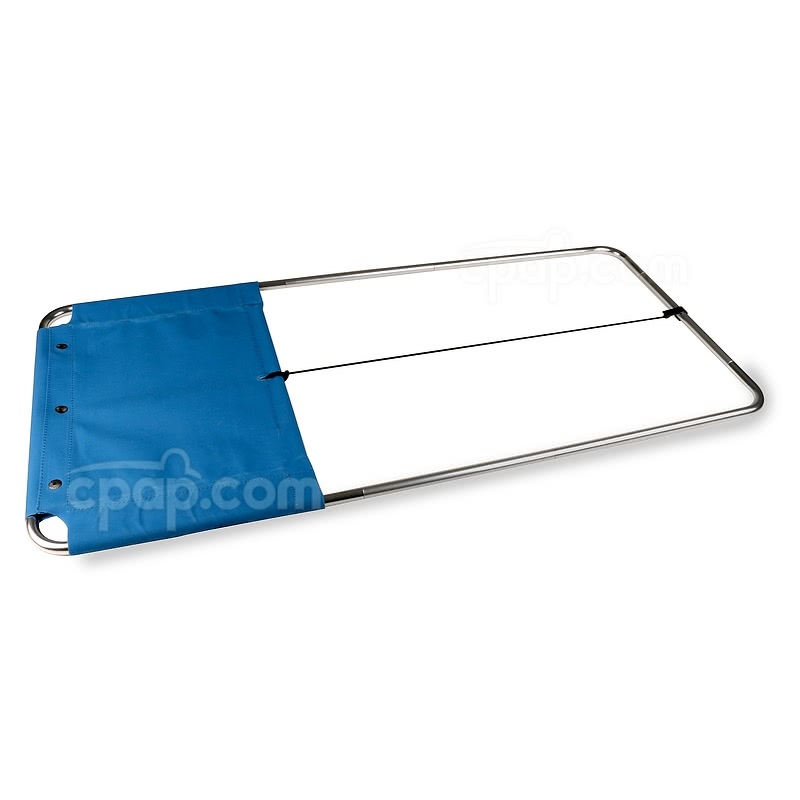 The Bedside CPAP Table is made of 8 sections of anodized aluminum which fit together easily and quickly to make the frame of the table. The fabric platform slides over one end and has metal buttons that snap together to hold it in place. Two bungie style cords are attached to the fabric platform. 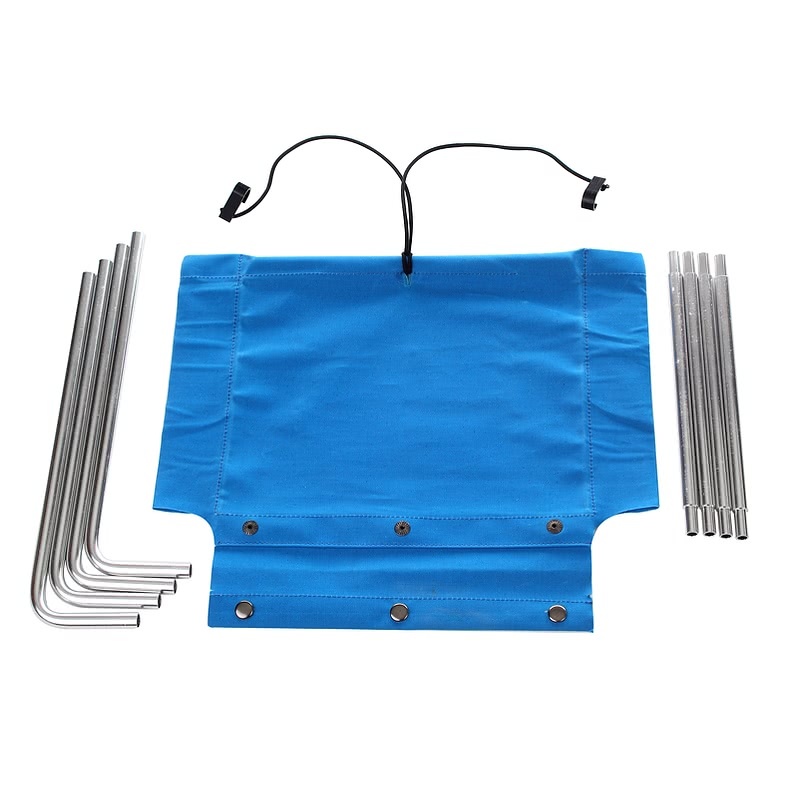 One is meant to stretch to the end of the table to be connected to hold the pieces together in a sturdy configuration. The other cord will then go over the CPAP and connect to the end of the table to secure the CPAP in place. Some hotel rooms do not include nightstands and make using CPAP therapy difficult. This system comes apart as easily as it is put together and can be placed back inside the included box to be taken while traveling. Manufacturer Instruction Sheet: Bedside CPAP Table Instructions. Mattress Compatibility: The Bedside CPAP Table requires firm placement between a box spring and mattress to be held in place. Beds that do not have a firm box spring or mattress should not be used as the table could become easily dislodged. Some bed systems which may not be compatible are Sleep Number beds, floatation sleep systems and water beds. Use with Adjustable Beds: Because this product is used by being secured between a mattress and box spring, extreme care should be taken when using with an adjustable bed. If the mattress is adjusted, it could result in damage to CPAP equipment if it falls. CPAP.com is not responsible for any damage to CPAP equipment in this situation.